Road to #1000: Who is Luthor? While we’re all looking forward to issue #1000 of ACTION COMICS, DC All Access co-host and Superman megafan Jason Inman is looking back…at some of the series’ best issues in this new ten-part column. A strong hero must always be confronted by a strong villain. Batman has the Joker, Green Lantern has Sinestro and Superman has Lex Luthor. Luthor’s comic book debut does not disappoint and features forward-looking comic storytelling that makes it seem like this is a modern comic book. So let’s put on your kevlar helmet and prepare for war as we continue our look at the ten must-read issues of Action Comics. My second choice is ACTION COMICS #23. By this point in Superman’s Action Comics history, he was regularly appearing on the cover. 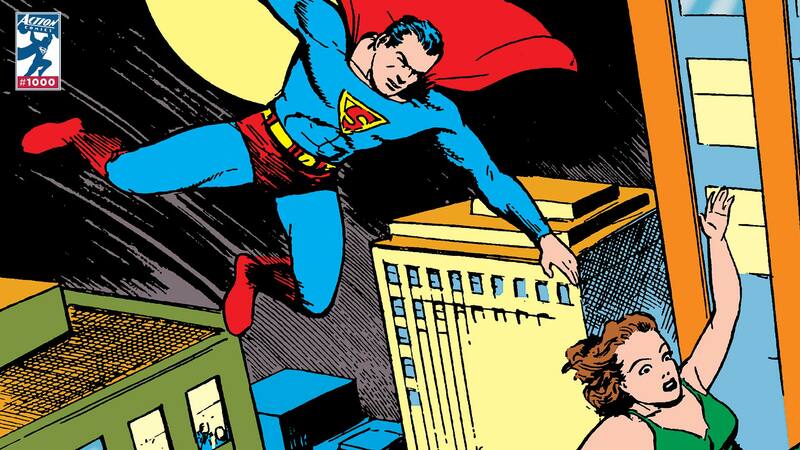 The Man of Steel was finally the most popular character in the book and the cover of issue #23 depicts him swooping from the sky to save a fair maiden. The story inside was titled ‘Europe at War, Part Two.” Now, Superman and his titles have a long history with war. Many of the Man of Steel’s books feature him proudly supporting America and its troops on the cover. Worth noting, however, is that even though Superman supported the war effort on the outside of his books, very few of the stories on the inside actually featured Superman fighting in a real world conflict. Like Action Comics #23, these issues featured smaller, more isolated incidents of war. Very much like how this story begins in the middle of the conflict between the fictional countries of Galonia and Toran. Readers of Superman usually expect one or two moments of gigantic superhero action in his comics, but this issue features several. It begins in the middle of a bombardment! Clark has to carry Lois to safety because she was knocked unconscious by an exploding shell. But not to worry, Lois, Superman bounds into action and throws a series of shells back at the attacking army. Great issues of Superman have to include an active plot for Clark Kent, as well. To me, the character is always at his best when both sides of his dual identity are utilized. Well, not only does Superman prove his might in this issue, but Clark Kent does as well. When Galonia uses an offer of peace as a bluff to attack the Toran army, intrepid reporter Clark Kent confronts the Galonian general. This one move kicks off the entire story of this issue. Kent uses information about the secret madman controlling this entire incident to convince the two nations to put down their arms and negotiate peace. In fact, it’s Clark Kent who makes the two warring countries sign an armistice, not Superman. Superman was too busy with another villain in this issue—a villain named Luthor. Soon, the cave comes crashing down upon both of them, introducing the readers to the first of several hundred death traps that Luthor will spring on Superman over the years. Luthor, as his next move, kidnaps reporter Lois Lane in an attempt to flush out Clark Kent, the man who is trying to promote peace in this war-torn region. When we first meet Luthor, he has red hair, wears a red robe and sits upon a throne. It’s quite a different picture than the Lex Luthor scientist and businessman that we’ll come to love and hate in the years ahead. But even in this early appearance, Luthor is a scientist of the first class. Lois soon discovers that all of his minions are mind-controlled; they bow to him and say, “As you command, oh mighty Luthor.” Also, Luthor’s home base in this issue is the aforementioned dirigible—which happens to be lime green. Even 80 years later, Lex Luthor will still love the color green. Of course, the issue ends with Superman defeating Luthor’s plan and Clark Kent filing one of the biggest scoops of his career. Issue #23 makes the list of must-read issues of Action Comics because it’s a big and bold story that could easily be adapted into a modern issue. Luthor steps right into this story with all his penchant for death traps and total control that we see him exhibit in later stories. Plus, it’s really interesting to go back to a moment in Superman’s history when he doesn’t yet know the enemy he faces—an archrival that would go on to share an 80-year history with him. Superman proclaims, “That’s the end of Luthor” at the end of this tale. Thankfully, the writers of Superman didn’t listen to him and deprive us of one of comic books’ greatest villains. This issue is surrounded by ground war conflict, but it’s the start of an eternal war between Luthor and Superman that makes Action Comics #23 a must-read issue. ACTION COMICS #23 by Jerry Siegel and Joe Shuster is readily available as a digital download. Jason Inman is the co-host of the DC All Access webseries. Look for him on Twitter at @Jawiin, and be sure to drop by next week for another of his must-read issues of Action Comics! Road to #1000: A Super-Kiss For a Super-Man!